Well here it is, the end of August and the hottest day of the year so far. Granted we have had a very nice and sometimes Colorado-like summer. But 100 degrees is HOT! You don’t really feel it,…. unless you go outside. It’s too hot to drive anywhere and get food instead of heating up the kitchen. Just thinking of small children and hot asphalt and a large moving metal box, gives me a heat rash. As a Texan would say, “It’s hotter than a burning stump.” Soooooooo, I have a ton of cherry tomatoes and a bunch a too big cucumbers, I decided to make gazpacho. I also made a super quick cucumber and shrimp salad to go with it. 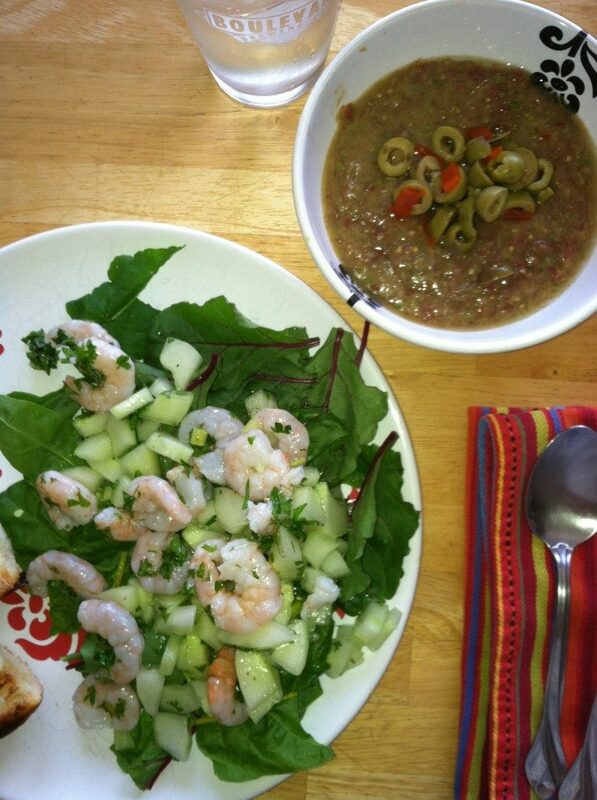 The salad turned out pretty bland, but what do you expect from shrimp and cucumbers. Bland and blander! To jazz up the taste, I served it over our Farmer’s Table Salad Mix, which is made up of beet greens/rainbow chard/arugula this week. The greens punched up the taste to make the salad nice and refreshing. The gazpacho turned out great however. Maybe the best I’ve ever made. Could the cherry tomatoes be the key? I’ve never made it with that kind of tomato before; and it was so sweet with a slow heat in the background from the poblano peppers I used instead of bells (more heat than I would think from such a mild pepper). The cherry tomatoes I used were mostly purple. I thought the final product would be brown-ish but it turned out green-ish with chunks of red. Who would of thought? In this recipe from The Big Book of Soups and Stews by Maryana Vollstedt, she garnishes with sliced pimiento-stuffed green olives. I thought this was odd but tried it and WOW they went perfectly. In a flat dish, soak bread in the cold water for 1 minute, turning once. Squeeze out excess water. In a food processor, combine cucumber, bell peppers, garlic, oil, vinegar, Tabasco sauce, sugar, salt, and pepper and puree. And half the soaked bread and continue processing until smooth, about 2 minutes. Transfer mixture to a large bowl or stainless steel pan. Add tomatoes and the remaining bread to the food processor and process until smooth, about 2 minutes. Transfer to bowl holding first mixture and mix well. Refrigerate for several hours or overnight. 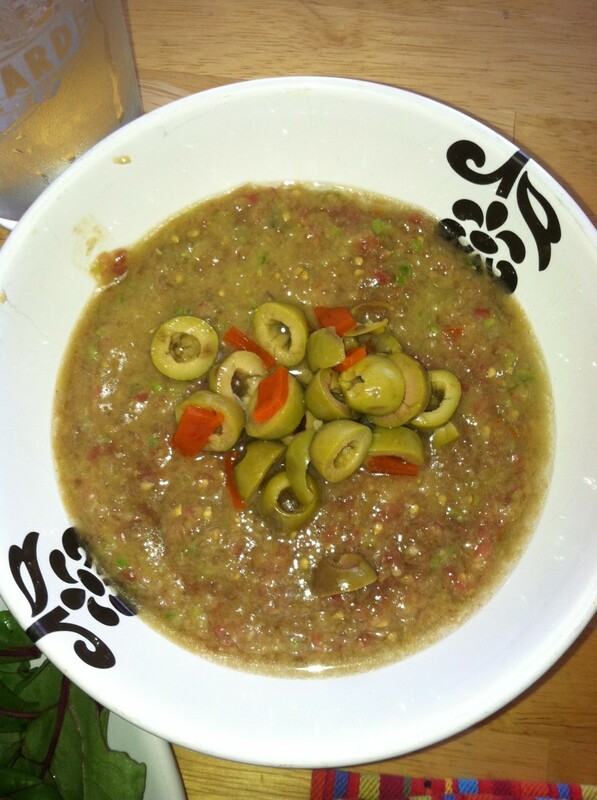 Ladle into bowls and top with sliced olives. There it is easy peasy. I did NOT peel the cherry tomatoes of course and didn’t use any Tabasco because I could smell that one of my poblano peppers had some heat. So I hope you try it on a day that is soooo hot that the trees are whistlin’ for dogs, or a day so hot your billy goat won’t go in the pepper patch, or a day so hot you’ll see a dog chasing a cat and they will both be walking…..I could go on…but I’m burned out.